Out of the Trees : Mankinds' first encounters with Water. Of course any consideration of mankind's earliest ecounters with substantial bodies of water is purely speculative, but in 1997 Morgan suggested that the development of mankinds' vertical stance and gait was enhanced by transversing large bodies of water, resulting from the climate change that induced the intial rejection of tree dwelling. This has been labelled 'The Aquatic Theory'. "It is possible that our early ancestors began their adaptation to bipedalism with initial wading behaviour, just as we see the modern macaques, probosis and capuchins doing. As it foraged for aquatic vegetation, and perhaps small crustaceans and mollusks, the little primate would soon discover it could wade deeper on two legs than four, thus expanding and exploiting available resources for food (Morgan 1997). This behaviour could have far-reaching consequences." If this theory has any validity, then humans developed an imtimate awareness of the pleasures and the dangers of water from their earliest times. It would be readily observed that the larger the body of water, then the greater the potential resources and the greater the potential danger. The Aquatic scenario may also relect upon possible tool use - a walking stick would indicate water depth and identify obstructions. At an extreme, observing small animals stranded on floating logs could have suggested similar possibilities for humans. "It's much easier to move quickly along a coast," said the Australian National University's David Bulbeck, a member of an international research team that studied people in the Malaysian peninsula. Debora Smith (Science Editor) : Earth's first beachcombers ended up in Australia. Sydney Morning Herald : Weekend Edition, May 14-15 2005 News : Page 13. Reporting research developments published in Science Magazine, 13 May 2005. Forster and Matsumura : EVOLUTION : Enhanced: Did Early Humans Go North or South? This would indicate that from circa 65,000 B.C.E. mankind was intiating the parameters of a maritime culture. The basic elements would be safety, weather prediction, harvesting food, recreation and transport. The ever present danger of drowning would primary in the concerns of a maritime culture. In life threating situations, one rule would become prominant - "Don't Panic". Furthermore, there may have been a growing awareness of the possibility of rescue, possibly in conjunction with some preceived social obligation to assist those in distress. In subsequent history, considerable activity will be directed to the development of efficient surf rescue technics and services. The ability to predict weather conditions is a significant determinant in successful harvesting and navigation. IIt enhanced safety by avoiding turbulent water events, and enhanced pleasure by attendence at sublime water events. In the 21st century, surf prediction has become a highly technologically advanced science. By confining occupation to a marine environment, food was harvested from a consistant source and employed a common inventory of tools and methods. Recreation in a maritime enviroment is determined by the prevailing weather conditions. Prime allocation must be given to suitable harvesting conditions, and the remaining leisure time is itself weather dependent. The first use of water for transportation was, undoubtably, by log. Whether by observation, accumulated experiernce or by accident; initial attempts to transverse deep or rapidly flowing water was probably by log. Note that for canoes the advantages were substantial, particually in the case of potential shark or crocodile attack. "Homo erectus, incidentally, concievably made boats as well as fire; we should not underestimate them." Recreational wave riding , either body surfing or assisted by a small board, was practised throughout the Pacific Islands and probably predates the Polynesian migration from Asia, which began aroudnd 2000 B.C. Their navigation skills took them to the Solomon Islands, around 1600 BC, and later to Fiji and Tonga. By the beginning of the 1st millennium BC, most of Polynesia was a loose web of thriving cultures who settled on the islands' coasts and lived off the sea. By 500 BC Micronesia was completely colonized. Initial migration by small groups across small distances in crude craft. Travell would be directed at observable land masses, that is approximately 5 kilometres. Craft could vary from a simple single log to a timber raft. As distances between islands became longer, larger rafts would be required to carry larger numbers of passengers and or supplies. On occassion rafts could possibly be wind driven by a simple square sail. The development from this crude base to sophisticated sailing canoes was concurrent with the use of a simple board for personal transport over short distances. 1. It was adapted as a tool of recreation (exhilaration?) with the development of surfriding. Plywood surfing, Barbados, circa 1988. 2. Originally a floatation devise, board paddling became the basis for Polynesian swimming, incorporating an overarm stroke of the arms and a sissor-like kick by the legs. Shooting on a board and in a canoe must have started further back than body shooting. ... The board is worked on the same principle (as the canoe), but its control calls for much greater skill. - Duke Kahanamoku, The Sun, Friday 8th January 1914. Interview by W. F. Corbett. At the start of the 20th century, the Polynesian style (often mis-labeled the Australian Crawl) was becoming the dominant competitive swimming stroke. It was emphatically demonstrated by Duke Kahanamoku's 1908 Stockholm Olympic performance. 1. wave riding is fun - the thrill of the ride in is greater than the effort of the paddle out. 3. the surfer must paddle in the same direction as the wave to achieve take-off. 4. the ride is longer and faster if the surfer rides diagonally across the wave face. 5. a rigid board will improve planning and paddling - but can also increase the danger factor. A small wooden prone board used thoughout the Pacific Islands, primarily as juvenile sport. In Tahiti, New Zealand and Hawaii the boards were ridden prone, kneeling and, occassionally, standing. Other Pacific Islands were restricted to prone riding only. Bishop Museum Collection. Holmes (1993) page 59. 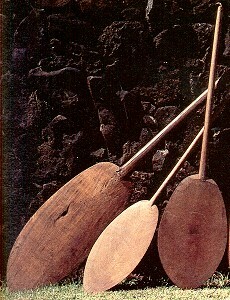 The paddles (hoe) held by the Bishop Museum have an average blade (laulau) length of 23 inches and a width of 12 inches. The large bladed paddle to the left is a steering paddle (hoe uli). It is 7ft 4'' long with a blade 38 inches x 16 inches. Most blade shapes "are slightly convex on both sides" however there is some variation. Note that the paddles were shaped from on piece of timber and a broken shaft would render the paddle unusable. Any of the illustrated blades would make a suitable paipo board. See Holmes Chapter 7 : Paddles. Paipo/prone board dimensions ranged from 3 feet x 12 inches (the smallest example in the Bishop Museum, Honolulu. Catalogue Number :C.5966) to 6 feet x 9 inch boards in Aotearoa (New Zealand). 6. Width is limited to the width of the ridder's shoulders. 8. The longer the board, the greater the paddling speed. 11. The tail is wide and square.- for maximum planning area and maximum safety. 12. Don't let go of the board. After European settlement of the Hawaiian Islands in 18xx, Hawaiian culture suffered serious decline. Various factors including the development of a cash economy, introduced diseases, and the moral conservatism of Christian missionaries are commonly cited as causes. For surfing, the crucial factors were the massive decline in population (almost 80% between 1778 and 1900) and the ravaging of the native forests by timber merhants. By 1900, the traditional surfboard woods had virtually disappeared and any new boards were built from imported timbers. These usually were short (seven to eight foot) boards ridden close to shore and crude in design and construction. Surfing's international status was boosted in October 1907 with publication in A Woman's Home Companion (of "A Royal Sport : Surfing at Waikiki" by Jack London. Jack London was a noted travel writer and the article was reprinted as a chapter in his book The Cruise of the Snark, 1911, His enthusistic instuctor was Alexander Hume Ford. In California the exposure was more direct - George Freeth, considered one of the top riders, was commissioned to demonstate surfriding as a promotion for a land sale at Renaldo Beach in 1907. His enthusiasm and ability encouraged locals to take up the sport, and this was given further impetus with demonstations by Duke Kahanamoku in 1912, both on the West and East coasts. Duke Kahanamoku extended surfing's influence with visits to Australia and New Zealand in 1914-1915. Surfing was limited to a very small number of native Hawaiians, but increasingly some Europeans became board riding enthusiasts. This was typified by the formation of the Outrigger Canoe Club by Alexander Hume Ford in 1908 at Waikiki. Ford enthusuiastically supported the traditional skills of surfboard riding and paddling outrigger canoes, and was Jack London's instructor. To encourage young surfer's, entry fees were set at a minimum and boards were supplied for use or purchase ($2.00 in 1909). Developments continued with the appointment of Dad Center as Club Captain and the membership of Olympic swimmer Duke Kahanamoku in 1917. The formation of the Outrigger Canoe Club encouraged other surfing clubs, most noteably the Hui Nui whose members included the Kahanamoku Brothers. Duke Kanhanmoku is credited with taking the sport to new levels of performance and with developing the 10 ft board. 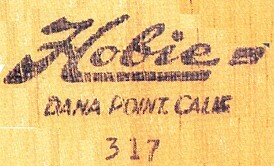 Using imported Californian redwood or sugar pine, he made thicker, wider and longer boards to compensate for the lighter native timbers of traditional boards. His basic design would be used around the world for the next 35 years. Blake also reported the length of this board as 14 ft 6 inches in 1935, see above. The board's paddling performance was demonstrated in 1928 when, after a slow start, Tom Blake emphatically won the 880 yards paddling race at the Pacific Coast Surfing Contest, Balboa, California. Blake, page 59. "It was called a 'cigar board', because a newspaper reporter thought it was shaped like a giant cigar. This board was really graceful and beautiful to look at, and in performance so so good that officials of the Annual surfboard Paddling Championship immediately..."